Judith came in from the fields where it appeared as though the whole com­mu­ni­ty was out har­vest­ing the new grain crop. The rains had ceased and the ground had dried enough to enable them to walk through the plants and col­lect the ripened sheaves. The stone house still felt damp from the win­ter and she helped her moth­er emp­ty the stor­age urns of the remain­der of the pre­vi­ous year’s grains. The mois­ture had got­ten into every­thing. They rec­og­nized the aro­ma of slow­ly fer­ment­ing wheat and bar­ley and they did not want the old to con­t­a­m­i­nate the new. Judith’s moth­er even took the lit­tle wad of dough she always removed after knead­ing to put in a cool cov­ered pot to help the next batch rise and added that also to the pile to take out and burn. They were so care­ful that after sweep­ing the stone floor with the palm fronds they took feath­ers and swept out the cor­ners. Judith thought about how the Chametz puffed up the bread she liked so much, yet con­sid­ered how a sim­i­lar spoilage often puffed her up with pride. She always felt cleansed as she warmed her hands with the heat of the burn­ing Chametz. Both because it remind­ed her of the escape from slav­ery to free­dom, the beau­ty of puri­ty and sim­plic­i­ty and because she knew it would only take a week for her moth­er to cre­ate a new starter, Judith didn’t mind eat­ing the Matzah her moth­er would make with the brand new dough. 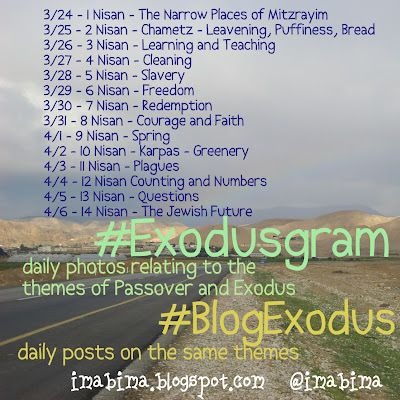 2 comments to #blogexodus : how do I cleanse my life of chametz? I just ran across your site while prepar­ing for Passover and will float your idea and sug­gest­ed top­ics there! Thanks! Thank you Stephen, may you have a lib­er­at­ing Passover.